Location Services | Bullseye Resource Center | Bullseye Glass Co.
Bullseye Glass has been called "...a barely definable hybrid of manufacturer, school, research center, retailer, gallery, and international artist community." Here's how those pieces fit together. Bullseye glass is manufactured in Portland, Oregon. Five days a week the skilled craftspeople in our factory pour, roll, and shape glass into sheets and other forms, using methods rooted in the late 17th century and re-invented by three artists who founded the company in the 1970s. 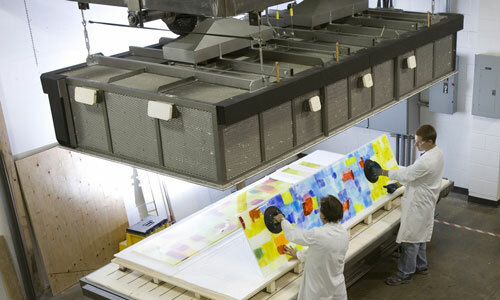 Today Bullseye provides more than 1,000 different glass products in a complex color palette to artists worldwide. We are constantly exploring new product possibilities and have been called "the most sophisticated glass-coloring company in the world" by legendary artist and chromaphile Dale Chihuly. Set in Portland’s art-rich Pearl District, Bullseye Projects explores contemporary glass with makers and viewers of all ages. 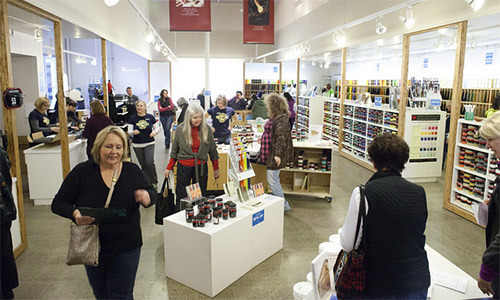 The Bullseye Projects learning studio—combined with Bullseye's existing gallery spaces and in collaboration with Bullseye's factory studio—allow artists, designers, architects and visitors of all ages new opportunities to see exemplary work and expand their creativity through glass. Bullseye Projects programs include exhibitions and educational programming, hands-on making and learning experiences, arts events encouraging exploration and dialog, artist residencies in Bullseye's facilities across the US, assistance to artists seeking large-scale commissions, and collaboration with museums, schools, and arts organizations around the world. Our Research & Education studios are located adjacent to the Factory in Southeast Portland, Oregon. Here, staff instructors and noted guest artists offer short-term classes year round for students at all levels. Our courses encourage fine design and craftsmanship and teach new approaches to kilnforming. R&E artist/technicians also test products, provide technical support to our customers, and assist visiting artists and architects from around the world in creating innovative new work. R&E documents the technical advances made in the process and shares them through educational publications and video lessons available to the public through our website. Bullseye Studio encourages and creates innovative use of kilnformed glass in the built environment. Our projects are diverse and often technically challenging. Collaboration with artists, architects and designers allows Bullseye to respond to and learn from those who wish to push the limits of kiln-glass, resulting in exemplary art and architectural-scale work. 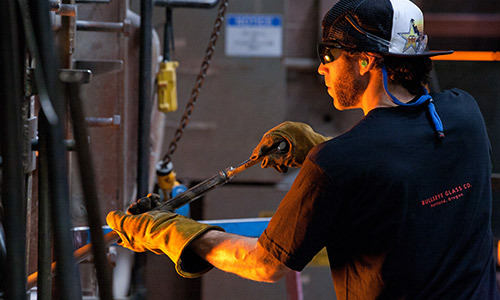 From coast to coast, Bullseye Resource Centers offer customers a direct connection to the Bullseye factory. We have Resource Centers in the Bay Area, Los Angeles, New York, Portland, and Santa Fe. 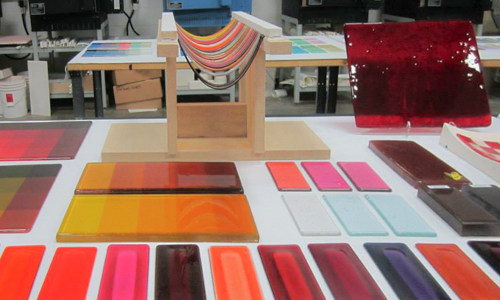 Each is a one-stop destination for the full line of Bullseye sheet glass, stringer, frit, and powder—plus all the tools you need to work with them. They also offer classes for all levels in a supportive, inspirational environment. 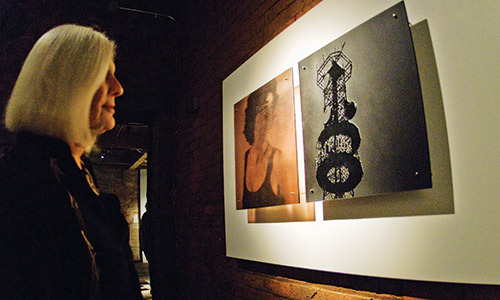 Resource Centers host artist talks and panel discussions to inspire and inform users about the wide range of methods available for working with the material.